Eurobronze Tanning now has the Radiant Far Infrared Sauna, utilizing the most advanced Carbon-Flow technology from Japan, which has been proven to have a wider range of therapeutic effects for the body and mind and increased detoxification results than a traditional sauna or steam bath. Today’s hectic lifestyles subject most of us to pollution, poor dietary choices and minimal exercise. The infrared sauna is an excellent way to get the benefits of exercise without the time consumption and undue stress on the body. The sauna penetrates deep into the fat and muscles of the body, creating powerful detoxification and cardiovascular benefits. At the same time, because the air temperature remains much lower than a traditional sauna, the person feels more comfortable and is able to sweat for a longer period of time and when finished, feels energized and refreshed, not exhausted. 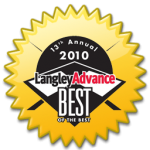 These features demonstrate the unprecedented health benefits of far infrared saunas not attainable with conventional saunas. WEIGHT LOSS by burning calories (900 Kcal in one 45-minute session) and direct excretion of fat molecules and cellulite. Also it creates a significant rise in the level of growth hormone which helps maintain lean body tissue and muscle. 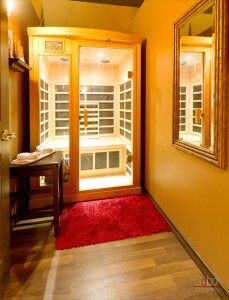 Far Infrared Radiant Saunas are the only natural way to burn calories without exercising. DETOXIFICATION from heavy metals and toxins in the blood such as lead, aluminum, mercury, toxic substances from food processing, lactic acid, free fatty acids, subcutaneous fat associated with aging and fatigue, excess sodium associated with hypertension and uric acid which causes pain and discomfort. CARDIOVASCULAR: Far Infrared exposure strengthens the cardiovascular system by causing an increase in your heart rate, cardiac output, and decreasing diastolic blood pressure. Extensive research by NASA in the early 1980’s led to the conclusion that far infrared stimulation would be the ideal way to maintain cardiovascular conditioning in American astronauts during long space flight. It also reduces Coronary Artery Disease by causing the blood vessels to become more pliable and releasing cholesterol toxins. HELPS TO RELIEVE PAIN and INJURIES in those suffering from Rheumatoid Arthritis, Fibromyalgia, and other chronic pain conditions. A case study reported in Germany worked with a 72 year-old woman who had a severe case of Rheumatoid Arthritis. She had reached her toxic limit of gold injections and her Erythrocyte sedimentation Rate (ESR) was still 126. After using an infrared sauna for less than 4 months her ESR was down to 12. FIR Saunas also decreases stiff joints and relieves muscle spasms. IMPROVES SKIN elasticity and appearance. Far Infrared heat increases circulation throughout your body resulting in glowing, beautiful, and youthful skin. Infrared heat penetrates 2 inch deep pushing out toxins while rejuvenating the skin. Some additional reported skin conditions which can be greatly improved by the infrared sauna therapy are: Acne, Cellulite, Nettle rash, Clogged pores, Scars from burns or wounds, Lacerations, Eczema, Psoriasis and Sunburn. INCREASES BLOOD FLOW and CIRCULATION that may help reduce the effects of the following ailments: Arthritis, Hemorrhoids, Diabetes, Varicose Veins, Rheumatism, Menstrual Cramps, hair growth and erectile dysfunction, healing of injuries and recovery of muscles and joint stiffness. Studies are still being conducted that show promising results in cancer therapy. STRENGTHENS THE IMMUNE SYSTEM and increases resistance to infections by stimulating increased production of white blood cells (leukocytes) by the bone marrow and killer T–cells by the thymus. CHROMOTHERAPY is an excellent feature on our Elite sauna model which you will not find in standard saunas. Color Light Therapy enhances the sauna experience by integrating color and light to specific areas and acute points on the body. Ancient Egyptians built solarium-type rooms with colored panels of glass so the sun would shine through and flood the patient with colored light. This therapy has been studied extensively in Europe and has been used successfully by a number of practitioners throughout North America. Each color has different health benefits: Red, Yellow, Green, Turquoise, Blue and Violet.